Don’t Let Knee Pain Keep You Out Of The Game! Dramatic Relief Is Now Possible If you suffer from knee pain that’s aggravated by twisting, squatting and walking, traditional treatments won’t help you take your life back. Surgery, injections and braces will only prolong your recuperation time. Instead, trust Class IV Laser Therapy to reduce inflammation, enhance tissue repair and improve circulation. «After 2 years of physical therapy in two different offices and three orthopedic surgeons recommending total knee replacement, I had 5 K-Laser treatments and finally began to have mobility, no pain, and reduction of swelling. I am now back in the game. Stop suffering and start living. Knee and joint pain don’t have to put you on the sidelines. 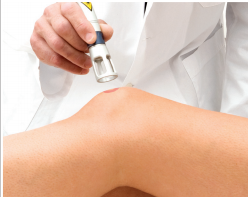 Learn more about therapeutic laser therapy.